Protect your Huawei Mate 9 with the Urban Armor Gear Plasma Case in Ice. This lightweight case features a hard armor shell and an impact-resistant soft core to keep your device safe. For added protection, the Plasma has scratch-resistant skid pads on the rear of the case and soft rubber surrounding your device's screen. Its oversized tactile button covers and large port openings make the case easy to grip and use. Box Dimensions (LxWxH) 7.8 x 4.5 x 1.0"
Plasma Case for Huawei Mate 9 (Ice) is rated 5.0 out of 5 by 8. Rated 5 out of 5 by contractorspov from The Only Rugged Case to have for the Mate 9 I really like this case. The fit is great, the feel in the hand is comfortable and it is not slick in the right places. 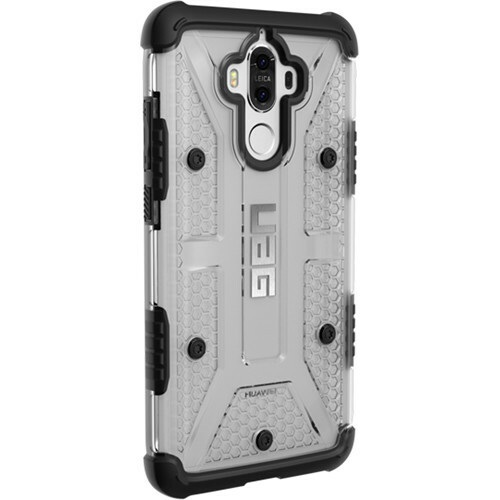 UAG is the only name brand case maker to make a rugged case for this phone...most others are low quality or not as protective. I personally like having a screen protector, but the UAG case does have raised edges on the front protecting the screen on flat surfaces. It does not come with a holster, which also would have been nice. Over all, I am very pleased with the case, I have 2 Huawei Mate 9 phones, and both have this case. Rated 5 out of 5 by Anonymous from Great Protection I've never been a fan of UAG cases and their looks, therefore I've never purchased one before. Huawei's wonderful Mate 9 however is lacking in high quality known cases; no Speck, Incipio, Otterbox, etc. This UAG fits the Mate 9 perfectly, all the cut outs are spot on, it adds virtually no weight and IMO actually looks good. Additionally your Mate 9 will be exceptionally protected and the button action is perfect. Rated 5 out of 5 by Lilian from Perfect Fit for Mate 9 Fits perfectly. Looks durable. I like the clear back and it's very light, so doesn't add weight to the phone. Rated 5 out of 5 by Tones14014 from Good case for mate 9 Hard to find cases for the mate 9, glad I found this one, it is stylish and easy to hang on to the phone. Rated 5 out of 5 by Anonymous from Best case ever. It's a strong case. Far better than the fancy ones that cost 100 dollars. Rated 5 out of 5 by Anonymous from Definitely recommended Nice fit, good quality and feels light but tough. Rated 5 out of 5 by Faruk from I would buy it again This cover is Number one for Mate 9?